For the past six years, Sonoma based artist and art historian Joseph Goldyne has been painting waterfalls, including small preparatory studies in indelible ink and oil, oils on paper, and vertical oil paintings on six-foot by eighteen inch canvases. Each waterfall is a product of the artist's imagination, and also a meditation on a wide range of artistic traditions. 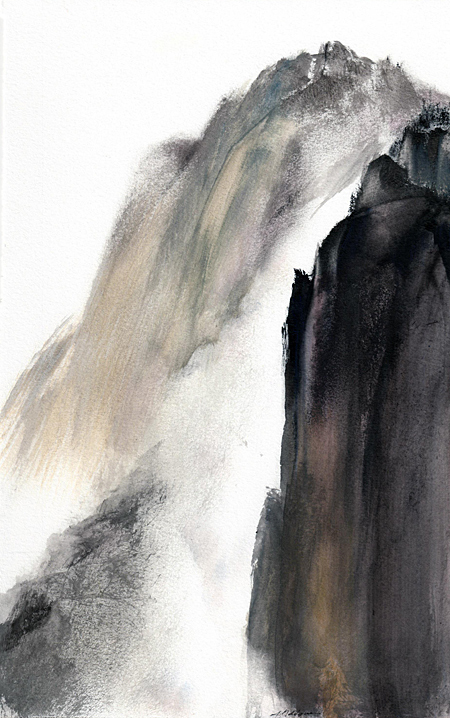 Now on view at Sullivan Goss in Santa Barbara through July 1st, Goldyne's waterfalls -- seen together -- are a visual essay on balance, flow and renewal. JS: What can you tell me about the history of your waterfalls? How long have you been working with these images, and what kinds of inspirations and sources are behind them? 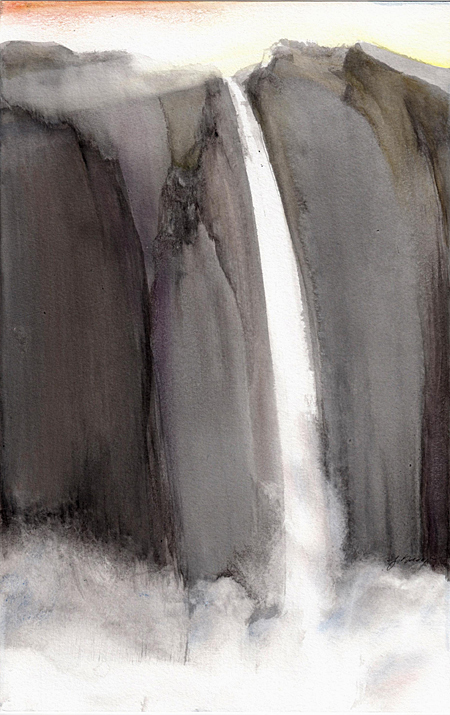 JG: I began to paint waterfalls in 2005. They have been a departure for me in a number of ways. For several decades, my work had been of fairly small size. I suppose the best-known pieces are the monotypes that began in the late 60s and that I still enjoy making. During the 70s, 80s and 90s I frequently found myself choosing a vertical format for the monotypes and some edition works as well. It seems I was drawn to the attenuated or compressed format long before I became preoccupied with waterfalls. I always favored shapes that soared: great trees and spindley flowers, skyscrapers and Egyptian obelisks. There is an aspirational aspect to such geometry that has always appealed to me. I also wanted to work larger and with paint. JS: Can you tell me something about the role of Asian art and aesthetics in your waterfalls? JG: In China and Japan, optically accurate depiction was rarely a goal, and subjects were rendered as a fusion of both impression and conception. One day, in 2005, while looking at a 19th-century Japanese Shijo school (Kyoto -based) scroll of a waterfall, it occurred to me that the waterfall was about the most ideally suited subject for the long and narrow format of a scroll. The waterfall, in fact, is so well served by the vertical, attenuated format of the paper scroll that it has an immediate advantage over most western interpretations. However, as an American artist, I was desirous of melding my appreciation of the sort of suggestion of detail that is associated with the plein-air oil sketch tradition with the Japanese sensitivity to geometry and refinement of form. It is interesting that the great majority of European and American depictions of waterfalls incorporate falls as a part of a greater composition, almost always in a rectangular (landscape) format. It seemed to me that one of the things the Japanese in particular understood is that by emphasizing the geometry of the scroll format in the choice of subject, there was a kind of reinforcement of the subject's worthiness. JS: Am I correct that the waterfalls are all invented? Early on in the series, did you have any real world waterfalls in mind? JG: Yes, all the waterfalls are imagined. I have of course seen a few falls in person, but I am ashamed to say that I have never seen the great falls, nothing truly awesome. I had thought of making a pilgrimage to experience some of them, but in the end there are several reasons I chose to work from my imagination. For decades, I looked at things as I drew them, and there was always this sense of the subject's demand to be drawn so that its form and detail were more or less obeyed. Yet, I always looked forward to drawing from my head: doodling if you will. When I doodled, I was free, though things tended to turn surrealistic; in other words, they turned tricky. They had a striking and relatively simple geometry that attracted my eye from a distance. They presented either a dramatic or more subtle contrast of color which also served to summon the eye from afar. As I approached more closely, attracted by geometry and contrast, there was sufficient detail to hold my eye's attention. That is, things did not fall completely apart, but rather became more interesting--there was some exploring to do that was not possible from far away. JS: In depicting moving water, how have you adjusted your techniques and media? JG: You would think that the grand moving spectacle of the waterfall is best treated in the movies, the great medium of the recent past. What a movie can do is to reproduce the motion in nature on a screen...at 24 frames per second. But in the visual arts, the movie is equivalent to opera; that is, it combines the visual with sound and acting. All these contributing arts have to be successful for the motion picture to be fully resolved. It cannot focus the mind in the same way as a planar depiction that distills rather than reproduces experience. My waterfalls suggest motion, but are more interested in the path that the motion has taken/is taking. In a way, my falls are depicting what one might consider the mind's wish for the course and setting of the falls. JS: Is there anything else that viewers should know about these works? 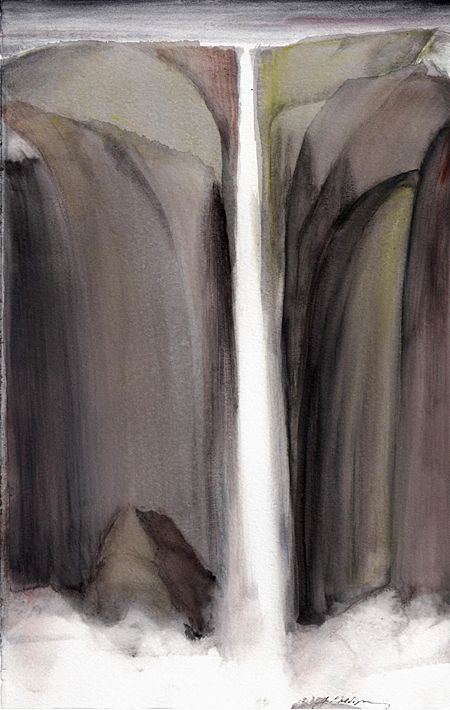 JG: Only that I prepare for the large 6 foot waterfalls by doing oil over ink 7" x 5" sketches on gessoed paper. I have done over 250 of these studies and I do them as exercises to prepare for the large paintings. I have never once transferred one of these small studies to a large format canvas, but they are my way of doing anything I like on a small scale. They are wanderings through the history of art, by turns Claudian, Turnerian, Asian or just my own take of the moment. I love doing chamber-sized works because they encourage a freedom of approach and become like a file of ideas.